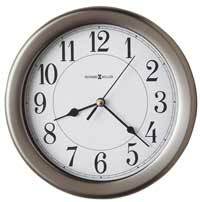 The Howard Miller Aaron is a smaller profile contemporary wall clock nicely contrasted by a burlwood printed back panel and features flat glass with polished mirrored edge that frames the dial and pendulum. In low light environments, this finish is very dark. White dial with black Arabic numerals, hour markers and hands surrounded by a polished nickel finished bezel. A contemporary nickel finished, cylindrical pendulum hangs below. Hinged front opening door. 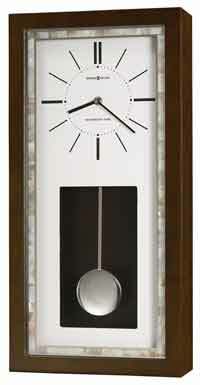 Accurate Quartz, battery-operated single chime movement plays Westminster melody and strikes on the hour. Volume control and automatic nighttime melody shut-off option. Requires three AA batteries. 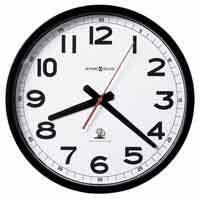 Clocks for sale at The Clock Depot including the 625-583 at discount prices.